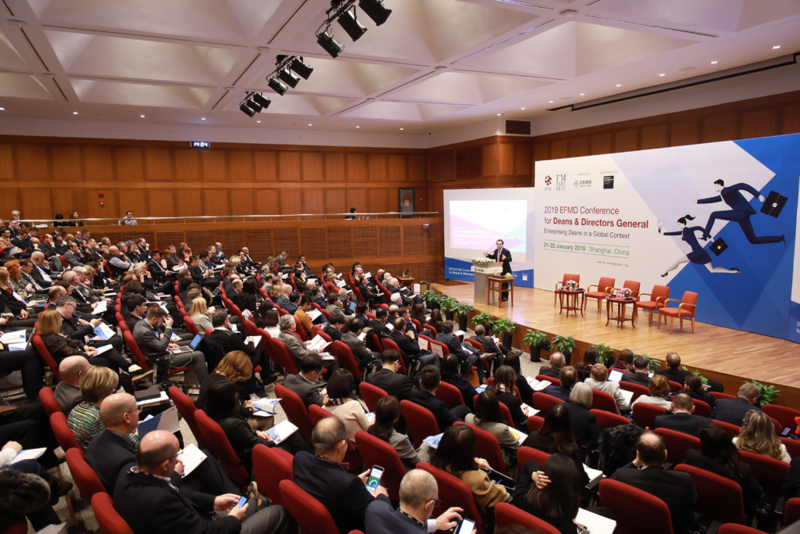 More than 300 heads of business schools from 53 countries gathered at the 2019 EFMD Conference for Deans and Directors General to discuss the innovative ways in which business and management schools reply to the rapidly changing economic environment, increasingly intertwined with the demographic, social and environmental challenges. It was a landmark event, as for the first time in its 46-year history, the Deans Conference took place outside of Europe, at the CEIBS campus in Shanghai – a symbolic place that testifies to the power of international collaboration and projects, a value firmly embedded in EFMD’s DNA. In his compelling speech, Eric Cornuel, EFMD’s Director General & CEO, outlined the unique history the school shares with EFMD, which is the European partner in this 50-50 joint venture founded in 1994 by the Chinese government and the European Union. He also paid tribute to the school’s past leaders and their role in CEIBS’ growth, as well as the leadership team now taking the school into the next phase of its global development. Eric also spoke of the role that CEIBS has played in paving the way for quality management education in the wider Asian region, which now counts 160 EFMD members, out of which 38 are accredited by EQUIS. He also emphasised the role CEIBS has played in China’s economic development that has seen millions lifted out of poverty. Under the theme Enterprising Deans in a Global Context, the subsequent panel discussions and break-out sessions aimed at contributing to the understanding of advances in management development – with a Chinese focus, as explained Ding Yuan, CEIBS Vice President & Dean, who set the scene for the two days of the conference. China is the second world economy and the largest consumer market in the world as well as the cradle of some of the most successful high-potential and high-growth companies, which rapidly expand to the markets overseas. In the first panel discussion, executives from Shang Gong Group, Ningbo Joyson Electronic and Chervon, analysed the unique opportunities and challenges Chinese companies going global face. In his data-rich talk, Robert Kennedy, Dean of Nanyang Business School, investigated the changing landscape of the world economic order and its impact on business schools. By 2030, BRICS countries would match the developed economies in terms of contribution to the global economy and surpass them by 2050. With the increasing digitalisation and the rising share of gig economy led by the emerging markets, the elite schools in the region will take a more prominent position on the world stage. Moreover, the diversification and fragmentation of the business education market, embodied by the proliferation of professional Masters and on-line learning provisions, will push schools towards more specialised programmes, individualised learning paths and a greater role of a schools’ leadership professional skills essential to remain competitive. How can schools respond to and steer these changes? In the last plenary session of the day, three deans from India, South Africa and Sweden engaged in debate. Rajendra Srivastava, Dean of Indian School of Business, underlined the need for more multidisciplinarity, teaching influenced by practice, and applied research adapted to the local context. At the time of visible erosion of multi-lateral agreements, Per Cramér, Dean of the University of Gothenburg School of Business, Economics & Law, emphasised the increased importance of impact and relevance in business education; coupled with true integration of ethics, responsibility and sustainability in teaching and research. Piet Naudé, Director at the University of Stellenbosch Business School, seconded his co-panellists, calling for greater integration of social values such as trust, cohesion and inclusiveness, critical in the context of digital disruption and automation on the job market. Break-out sessions included discussions on the issues such as diversity, talent, alliances, professional development of business schools’ leaders; along with a look at the broader topic of innovation, specifically in areas such as online-learning, relevant business education, knowledge creation and societal impact of business schools. Finally, Chen Weiru, Chief Strategy Officer at Alibaba’s logistics arm, Cainiao Network Technology, and a CEIBS professor currently on a sabbatical leave, gave the audience unique insights on how it is like to make the transition from an academic to a practitioner. In his passionate presentation, Chen talked about the future of logistics in the growing e-commerce economy. He also touched upon broader perspective leaders need to consider in their leadership roles. Next to the IQ and EQ, equally important are AQ (adversity quotient) driving resilience and LQ (love quotient) driving empathy and altruism. We are delighted to announce the next Deans & Director General Conference will take place at SDA Bocconi, Italy. Pencil 13 – 14 February 2020 in your calendar and we look forward to seeing you in Milan. The 2019 conference was sponsored by EFMD’s strategic partner Graduate Management Admission Council (GMAC). A throwback at the live reactions from the conference are available on our Twitter moments feed. All pictures from the conference are available here.